Sami is an International award-winning designer and a firm believer of harnessing the power of design to create change. He is the mastermind behind innovation strategies at Blue Hat. With over 10 years of experience in digital design & strategy, and being a holder of an MA in Design Strategy and Innovation from Brunel University, London, Sami has empowered many leading companies in the Middle-East. Through his journey to promote Design as a problem-solving discipline, Sami united these talented people under Blue Hat to spread innovation & creativity! Judy is an international award-winning entrepreneur who utilizes Design Thinking to identify your needs, the challenges facing your business, and new opportunities that will help your brand achieve radical innovation. She has over 5 years of experience as Head of Social Media for leading digital agencies in Beirut. Being a holder of an MA in Communication Design from London and another MA in English Literature, Judy will ensure your brand's image, experience and promise are innovative and differentiated. Elif is an international award-winning designer. She represents Blue Hat in Istanbul. This Turkish-born creative soul is a traveler at heart. Living between 3 different countries around Europe and being a speaker of 4 different languages have enabled Elif to successfully work with a variety of clients. Her BSc in Product Design, and MA in Design Strategy & Innovation from London have helped bring forth her problem-solving nature and creativity. Elif has also profound knowledge in organizational change in the industrial sector. Fawaz Hmaidan is our latest partner at Blue Hat. His great leadership skills coupled with over 38 years of experience in the business field, will ensure your business is on the right track. Fawaz holds a BS in Mechanical Engineering from the University of Arizona which is rated top 75 universities in the USA. We believe in creative diversity at Blue Hat, Fawaz’s engineering brain is the perfect fit for business development. A talented Volley Ball player by day, and a hell-of-a-developer at night! John has extensive knowledge in software development that he even founded his very own e-commerce platform. John has a great passion for coding, high appreciation for design and a strong determination to build every project from scratch. John is currently pursuing an MS in Computer Science and teaching a couple of programming courses at the American University of Beirut. Severine’s keen interest in delivering the best cutting-edge designs and her perseverance are what makes her a perfect fit for Blue Hat. She has an MA in Design and is currently pursuing a PhD . 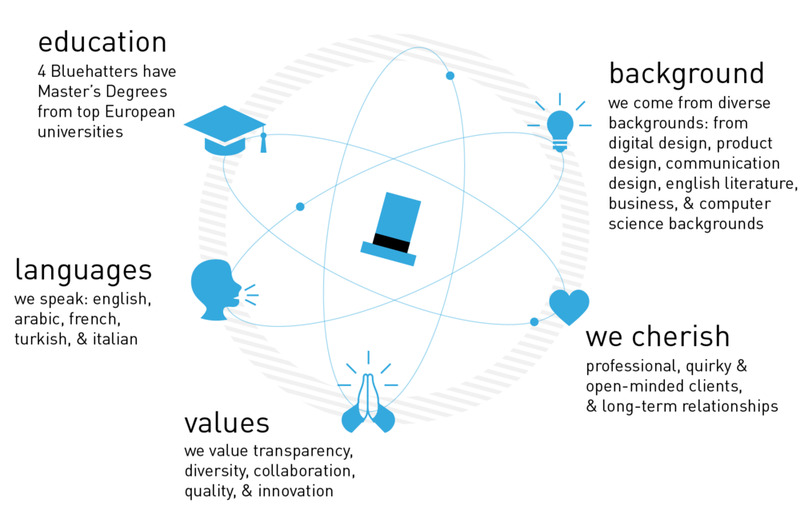 At Blue Hat, Severine will aim to make your website award-winning, and create compelling identities for your brand. When she is not designing at Blue Hat, she is either drawing for fun, or enjoying an acting or dancing class. Sally is our online Marketing specialist. She is keen on making sure you get the best out of your target audience. Holding a BS in Business Administration with an emphasis in Finance and Accounting from LAU Beirut, Sally oscastrates and dissects the analytics to lead your business in the right direction. Her fortes goes beyond studying the market as she has a wide experience in community management and content creation. With Sally onboard Blue Hat promises to achieve your marketing objectives and oversees your projects success. Wafic is the latest Bluehatter to join our design team. He holds a BS in Graphic Design with an emphasis in Digital Design. His quirky character, and mild OCD behavior, combined with his super talent and creativity will ensure that your animations are impressive, your graphics are on-point and that your digital apps are user-friendly. Stay tuned for more of Wafic’s work. Lin fits exactly the definition of diversity that makes Blue Hat a unique place to work in: After getting her BS in Nutrition & Dietetics from AUB, she completed a MA in Innovation, Entrepreneurship & Management from Imperial College London. As a Bluehatter, Lin always stays up-to-date with the latest trends disrupting your industry and utilizes her findings in your strategies. Being a left brainer, Lin also scans and analyses your brand's performance, generates reports, pinpoints problems, and recommends solutions in order to help you innovate. Being a holder of a BA in International Business from LAU, Nour believes in the power of social media to make your business succeed online. Her passion for photography makes her a well-rounded, very skilled Bluehatter. Nour’s creativity never stops running; even during days off, she is constantly coming up with the next great idea that fits your brand. Away from Social Media, Nour’s passion lies in traveling and discovering new restaurants all while staying healthy. Her fitness tips keep our health at the office always in check. Hanine's avid social activism brings a fresh breath to the office's atmosphere. With a BA in English Literature, when she's not focusing on animal welfare and feminism, she's working towards her second BA in Media/Communication with minors in Film and Arabic Language. She prides herself on having a way with words and dreams of becoming a thesaurus one day. Holder of a BA in Medical Lab, Sabine is a doctor at heart. With her advanced left brain activity, Sabine scans and analyses your brand's performance, pinpoints problems, and prescribes solutions in order to help you innovate by translating data into insights. Other than her medical passion, great talent in cooking, amazing research skills, and great attention to details, Sabine is responsible of Analytics and managing online marketing campaigns.